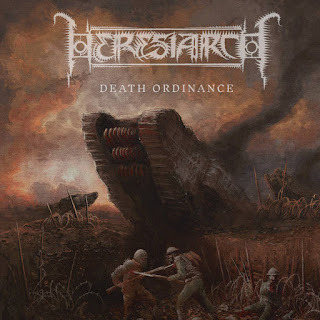 Heresiarch are a band from New Zealand that has been featured before in this zine and plays a bestial mixture of black, war, and death metal and this is a review of their 2017 album "Death Ordinance" which will be released in July by Dark Descent Records. Atmospheric soundscapes start off the album before going into a heavier direction which also introduces bestial death metal growls onto the recording and when the music speeds up a great amount of tremolo picking and blast beats can be heard which also gives the songs a more raw war metal feeling. Black metal screams are also added into some parts of the songs and you can also hear some Australian and Boss Bay influences in the bands musical style while the solos and leads also add in more of a chaotic style and the songs also bring in a great mixture of slow, mid paced and fast parts along with a great amount of brutality and some of the riffs also bring in a small amount of melody and a couple of the tracks are very long and epic in length. Heresiarch creates another recording that remains true to the bestial mixture of black, war and death metal of previous releases, the production sounds very powerful while the lyrics cover a future ravaged by 30 years of war. In my opinion this is another great sounding album from Heresiarch and if you are a fan of bestial black/death and war metal, you should check out this recording. RECOMMENDED TRACKS INCLUDE "Consecrating Fire" "Ruination" "lupine Epoch" and "Desert Of Ash". 8 out of 10.